Happy Friday Ya’ll! We have been super busy this week. We were so busy that we did not get everything done. I hate it when that happens!! I’m linking up with Doodle Bugs for Five for Friday. It feels like forever since I’ve done this linky. 1. We’ve been working really hard on shapes the past 2 weeks. 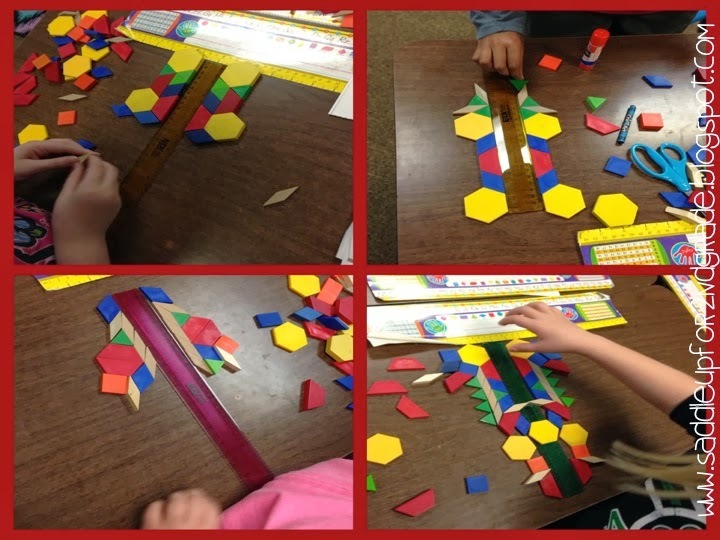 I love our shape unit. It is one of my favorite concepts to teach. 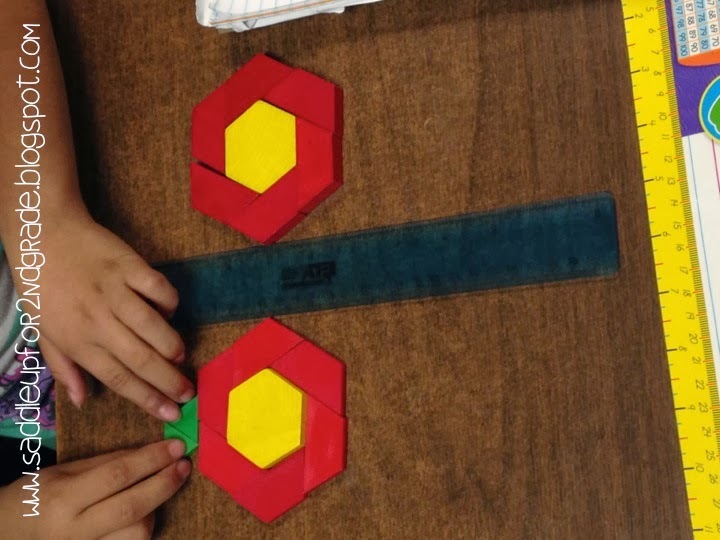 Here is one of my favorite symmetry activities. 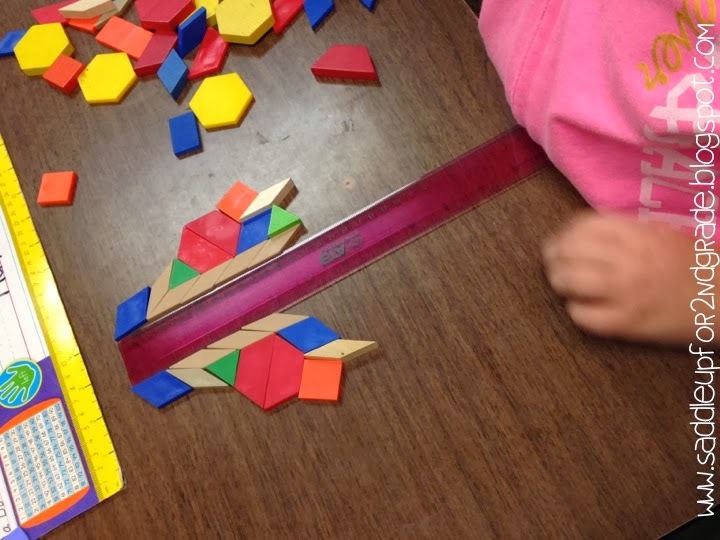 All you need is some pattern blocks and a ruler and let their imaginations fly! 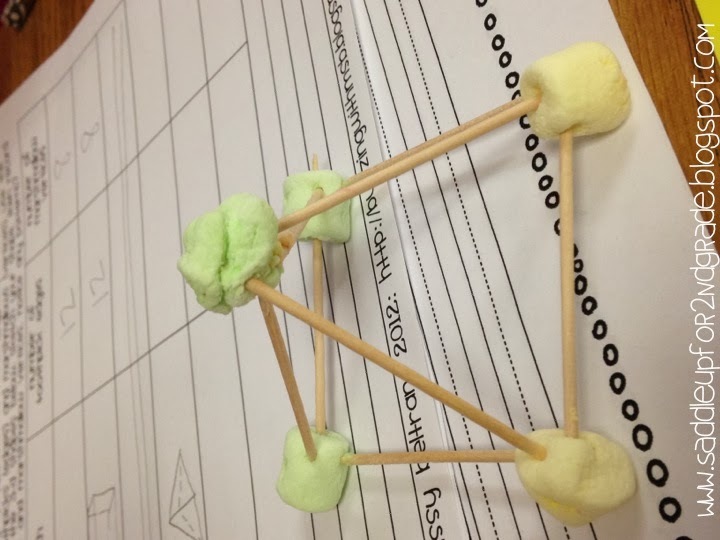 3D shapes were up next and we made tooth/pick marshmallow shapes. Last year I tried this out with pretzels instead of toothpicks thinking it would work better. 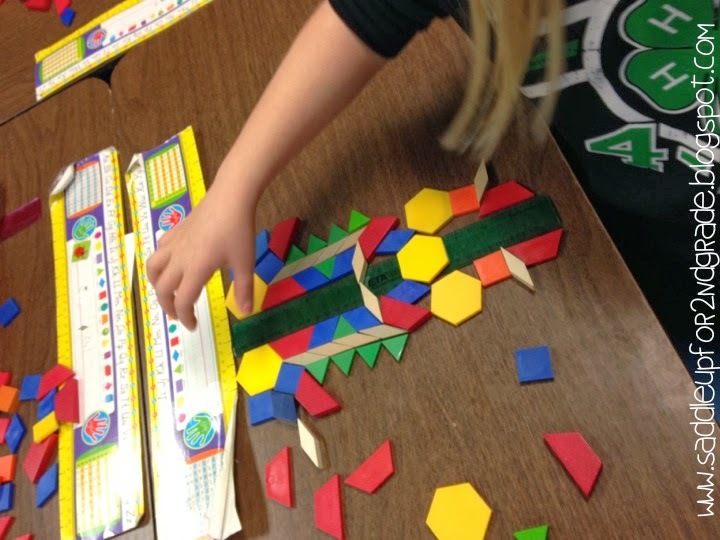 You can read all about our shape adventure from last year. 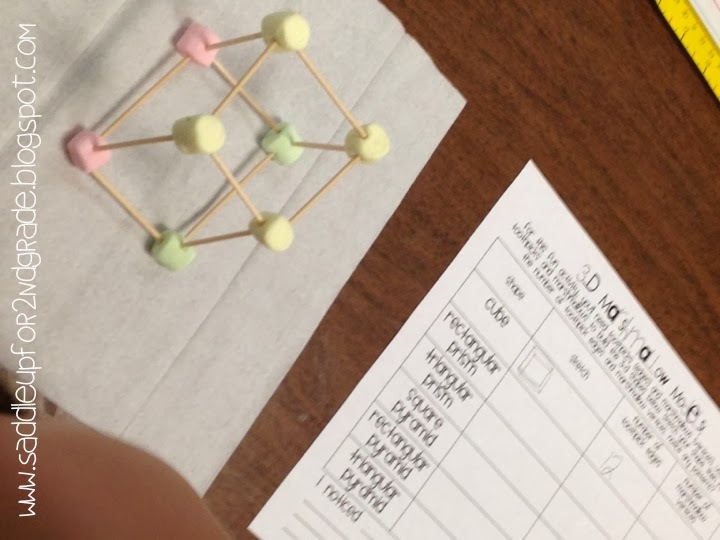 I was looking at that post today and went “UGH, I forgot I did that!” Anyways, back to our 3D marshmallow shapes. It went so well! Normally when I do this I have a bunch of kids whose shapes just don’t turn out right and they fall over and someone gets really upset. This was the first year it went perfectly and everyones shapes turned out! 2. I have REALLY, REALLY been working on my kids with writing. We made these super cute Olympian’ s from Amy’s unit. I actually bought those 2 years ago for the summer games and was super stoked when I remembered I had them because I knew I wanted to do some sort of Olympic writing. I got the paper from Katie’s Winter Games Freebie! 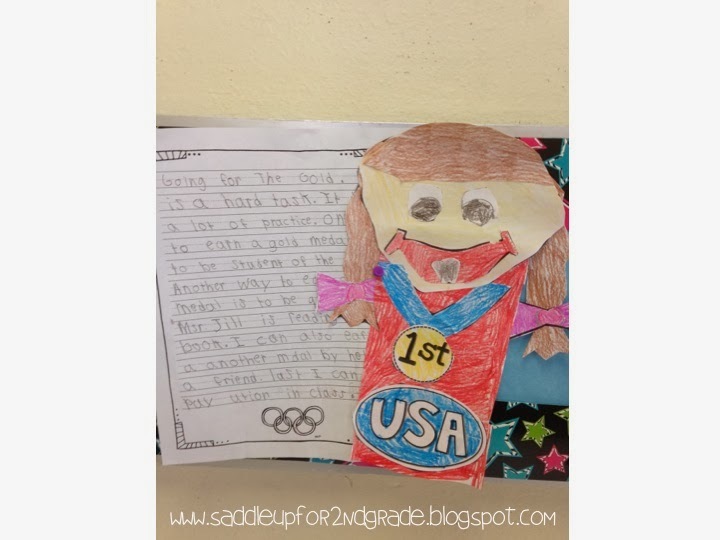 At first we started writing about their favorite Olympic sport but that quickly changed when a lot of my kids weren’t even watching the Olympics. 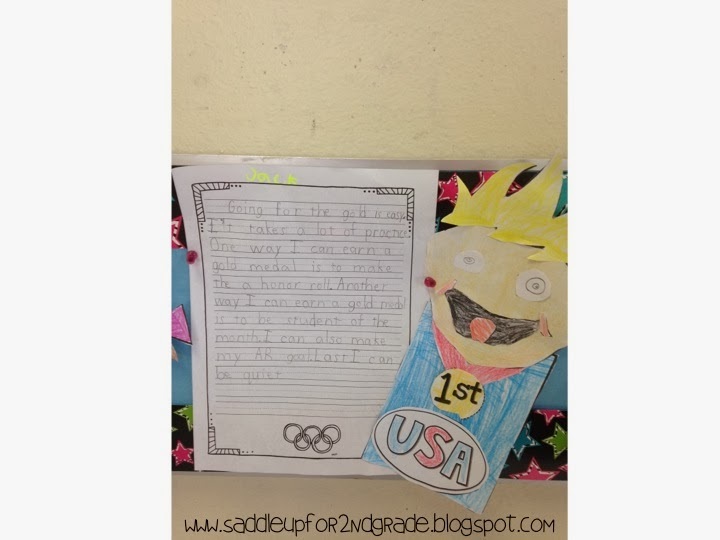 I then changed it to Going for the Gold: How can we earn a gold medal at school? 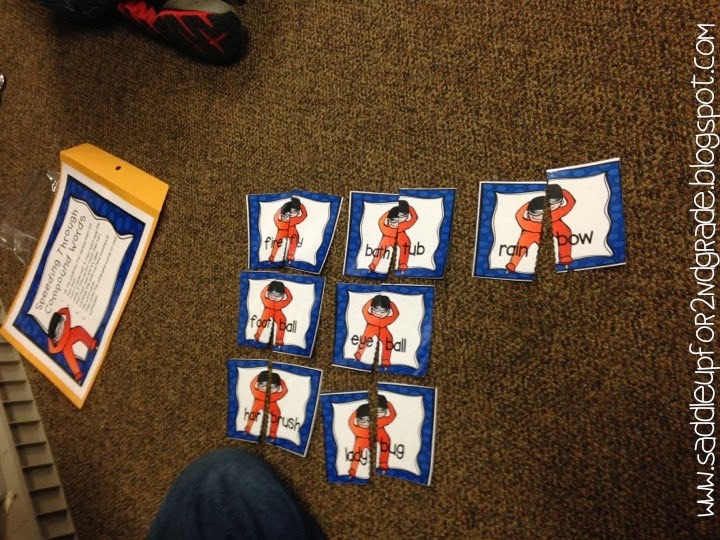 It was a perfect review for them to come up with ways to earn DoJo points! I’m running low on colored paper so they colored them instead! Even though its not as neat, its more personable and I love that! 3. Speaking of the Winter Games…I’ve teamed up with my sweet friend Anna from Simply Skilled in Second for a Winter Games Giveaway! 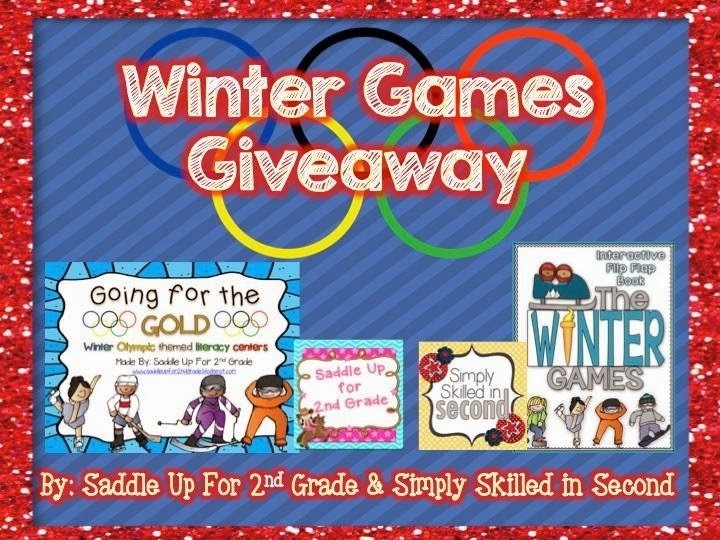 You can enter to win my Going for the Gold Literacy Centers and her Winter Games Flip Flap Book. All you have to do is “LIKE” our Facebook pages and comment on our giveaway picture. We’ve been using my Going for the Gold centers the past few weeks during our center rotation. I had a chance to snap a few pictures but not many because I’m normally working with small groups during this time. 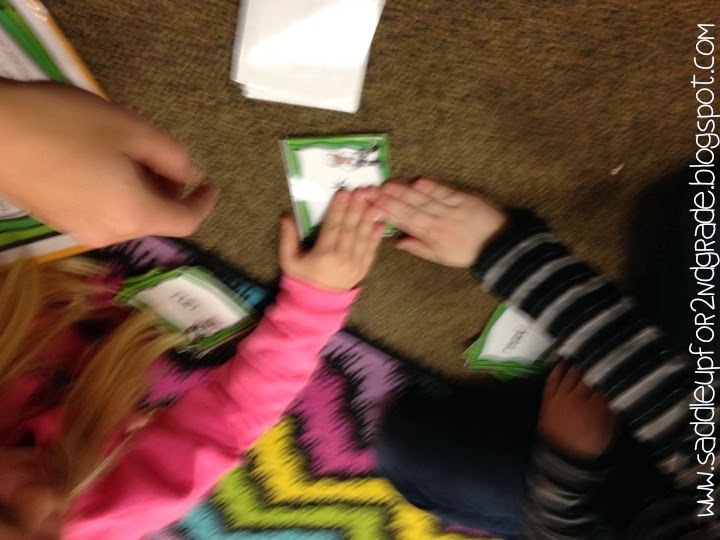 One student turns over a card while the other two “slap” the card gently. 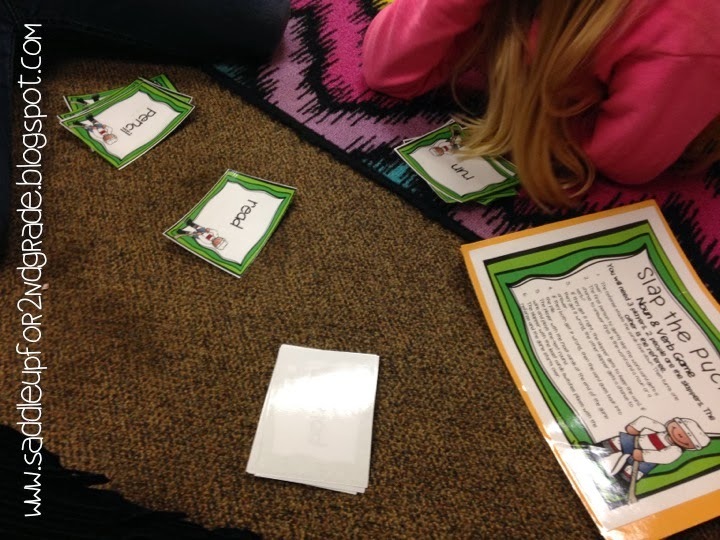 The first person who slaps the card has to say if the card is a noun or a verb. If they get it right, they get to keep it. If they are wrong, the other person gets a chance to answer. This one is a class favorite! Check out my Facebook page or Simply Skilled in Seconds page for a chance to win both of these units. We will pick a winner on Saturday morning. 4. 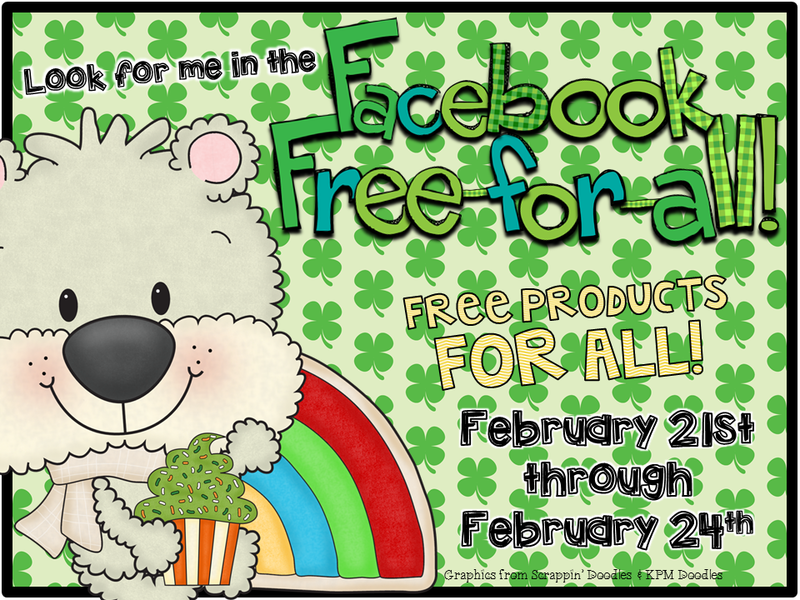 I’m super excited to apart of this months Facebook Free-for-all! I’ve teamed up with SEVERAL other bloggers to offer you exclusive FREEBIES that you can only get if you are a fan! Head on over to my Facebook page, click LIKE, then click on the Free-for-all tab to claim your FREEBIE! From there you can access other fabulous freebies. You don’t want to miss out on this! 5. Last but not least, if you are a follower of teacher bloggers on Instagram, I’m sure you have seen the Jamberry Nail craze! I tried Jamberry at the beginning of the year and fell on LOVE! I always loved to have my nails done but never liked the cost, or to have my nails long. 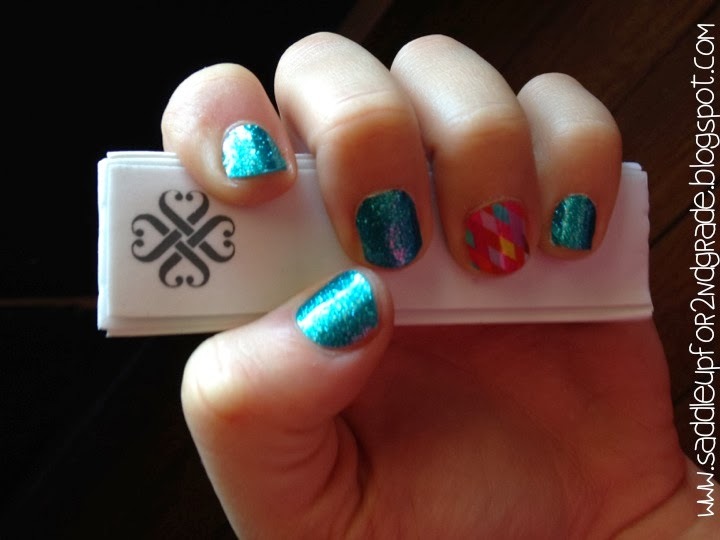 Jamberry wraps have solved all my nail problems (even my biting habit!). They are vinyl adhesive wraps that apply to your nails with heat. They don’t chip and last up to 2 weeks on your hands and 6 weeks on your toes. Did I mention that they come in HUNDREDS of designs. There is a wrap for everyone. Do you wear acrylics? Jams can be applied over them for an ancient nail. I’d love to share more information about Jamberry with you. Head on over to my Jamberry page for more info. If you visit my Facebook page, and click LIKE..leave me a comment saying you came from my blog and you’ll be entered into a drawing to win a FREE sheet of wraps! Here is a picture of my current Jamicure! I have had these wraps on for 9 days and they still look perfect! Thats all for now! Now go grab you some FREEBIES in the free-for-all! Happy Friday!